Here’s one I prepared earlier. One from the archives if you will, my review of John Joseph Brill at the Scandinavian Church for Getintothis. Images by Keith Ainsworth and myself. A damp Friday night in a church is not something we would readily go for. But given the dearth of suitable sized interesting venues in the city our intrepid promoters are on the look out for unusual performance spaces. This one could probably top that list. With coffee, tray bakes and handmade crafts available on arrival, a room full of punters with bags of bring your own booze and a fair smattering of hope it is fair to say there is an odd air in the Park Lane situated Scandinavian Church; especially when you add the condensation rising from those gathered. The reception area looks a lot like you would imagine a church space would of a damp Friday evening. There are regular church goers mingling happily with punters but the coffee and tray bakes more than make up for the oddity of the space. At the allotted hour and with the polite ring of a bell the hippies and beer are shepherded upstairs. Having not been in this space before the room is quite something at first glance. An octagonal room with stone pillars, leaded windows and a huge vaulted ceiling it is an incredible space for what the evening brings. While it’s hard to ignore the religious paraphernalia, the holy pictures, the crosses and, well, the altar, this evening’s performers do a sterling job of taking our minds off it. For very different reasons. A steward from the church gives us the official welcome, runs through the housekeeping and gives us a brief history lesson. The church was built in 1883 for Scandinavian Seamen away from home and is currently run by volunteers, it costs a grand a week to keep. The fact that a building and community of this kind opens its doors to a show like this is rather wonderful. We wholeheartedly agree with the desire to keep it out of the hands of a well-known developer so we’d suggest you support these shows. Every little helps. It is often said that being first on stage comes with its own difficulties. We know from experience that keeping a guitar in tune in a room this chilly over the course of a few hours is tricky at best. Getting past the early blips Mick Roach sets off on a soulful journey through what we imagine is a long and perhaps unforgiving memory. With a raspy tone, he delves into stories of heartbreak, frustration, and determination. The addition of the second vocal on some tunes lends an ethereal depth, almost giving the other side of the stories, the echo is beautiful and just a little haunting. It doesn’t take much of a PA for the room to show what the acoustics are like and it as a thing of beauty. We get the impression that Roach writes most of his songs in the wee small hours when sleep evades him. We’re Old, in particular gives a whiff of a sleepless night, it sounds like the ramblings of a man desperate for sleep, its bluesy, angsty and spiky, a lovely thing. It’s not nice to wish sleepless nights on someone but the depth in Roach‘s music makes me want to buy him a strong coffee in the interval. To say that Lives set a distinct change of pace is perhaps an understatement. Punchy, rocky and loud, the three guitars and crashing drum kit bring a decidedly upbeat tone to proceedings. A tone that for us was, for the first song at least, a little lost in this room. The crowd are hugely appreciative, the sound man gains some control at the start of song two but ultimately the stone, the pillars and that octagonal beauty do a number on the acoustics. When the bloke in front of us gave up all hope and left around the middle of the third song was obvious his ears had had enough. We were only saved by years of gig going and the associated and irreparable ear damage. That’s not to say we didn’t enjoy it, quite the opposite, they played an absolute blinder, we just thought they played it in the wrong room. With pitching angles, an angry and oddly poppy underbelly, a beautiful play between guitars and bass, the odd three part harmony and just enough fuzz it is exactly the kind of thing we’d go right out and buy. They have a huge amount of energy and hooks in all the right places. Just maybe not this one. Ones to watch at any rate. 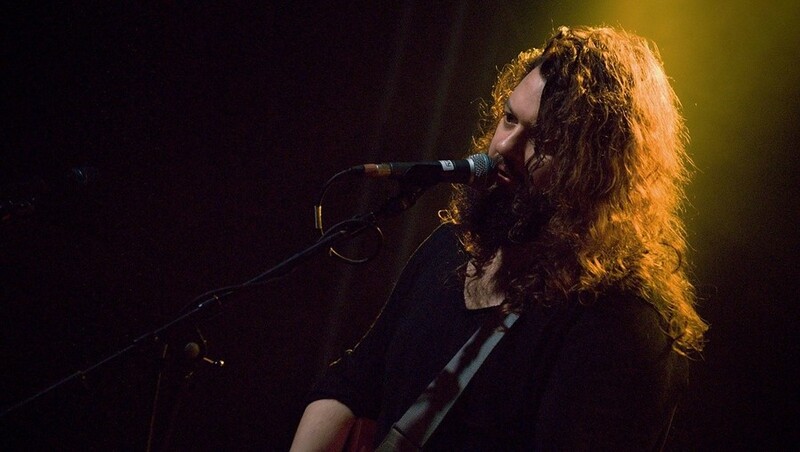 We first saw John Joseph Brill supporting Walking on Cars at Arts Club, he was ignored and honoured in equal measure as we pointed out recently. With Lives kicking the cobwebs from the eaves it was a fairly safe bet that everyone would be awake and paying attention by the time he walked on stage. Brill‘s support slot at Arts Club was a solo affair, there are excited rumblings when the drum kit remains on stage along with four mics. It is clear from the offset he is among friends, in a packed room. With a full band Brill is a very different proposition, straddling a space somewhere between Editors, The National, Arcade Fire and Nick Cave, there is a brooding, heartfelt, autobiographical soul to his work. There is a wonderful quote from the sleeve notes of an old live recording that has stayed with us for years. It questions whether the room in which the recording took place would be long enough to hold the lead singers 1000 yard stare. While it is rude to steal that in its entirety it seems apt in this situation. The intensity in look, sound and presence is apparent from the get go. It’s almost unnerving. Brill starts upbeat, thrashing around (we guess avoiding the up lighters) he rattles through three punchy songs, his gravelly baritone digging through us, wailing where necessary before slowing things down to his more usual sedate pace. He informs the congregation that this is his third night in a row in a church (Who knew?) and we are blessed that he has not spontaneously burst into flames yet. I think he’s been expecting it. A church, this church, tonight, might actually be the best place for an act like Brill. There is something dark, mysterious, disturbing in his lyric, the deep bass, the thunder in the soul and the frustration all seem to fit perfectly in a place built for tired, weary travellers. This might just be the place for a tired, weary troubadour. There is a confessional aspect to a lot of this, as though Brill needs to be in this room with no one but the vicar, we’re left feeling a little voyeuristic. In much the same way he advised those at the Arts Club show he warns those here that if they are of a sensitive disposition they should reconsider their choice of entertainment for the evening. There is a pause to see if anyone moves. Everything from the fourth track gets darker, there is a tension, tenacity of purpose, introspection. Everything is up for discussion, life, relationships, loss, death. Proving that there is no place within you that is so dark that it can’t be dragged out, written down and put to use. Sometimes it’s good to hold onto your monsters. Brill demands attention, his music demands you listen, his demeanor demands you watch, the performance is simply outstanding. While he plays an all too short a set for our souls we retreat to the tray bakes (via the merch stand) before stepping back out onto a drizzly, considerably darker street.